Item is a manual focus, folding 35mm camera with Synchro-Compur lens. Made in Germany. An instruction book is included. Made in Germany at Kodak AG. Item consists of a Voigtländer Vito BL 35mm viewfinder camera. It has a Voigtländer Color-Skopar 1:3.5/50mm lens and a Prontor-SVS leaf shutter. It is similar to the Vito B, but features a built-in exposure meter. Item is a 35 mm single lens reflex camera. Features include automatic exposure using selenium light metering, with 3 sensors positioned around the lens, a Lanthar 2.8 50mm lens, and Prontor-Matic-Y shutter. 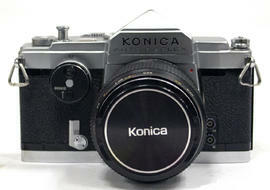 Item consists of 5 one-time-use, 35mm, 15 exposure cameras with Kodak Max film and flash. Cameras have floral design, intented to be placed on tables at wedding receptions. New in box, fIlm expiration date, November 2003. Item is a one-time-use, 35mm, 800 ISO, 27 exposure camera with plastic, waterproof case. Film expiration date, April 2002. Item is a one-time-use, 35mm, 27 exposure camera with Kodak Max film and flash. New in box, film expiration date, February 2004. One-time-use, 35mm, 27 exposure camera with Kodak Max film and flash. 7 exposures made. Film expiration date, February 2004. Item is a stereo camera made of metal and plastic. Camera takes pairs of 24 x 24 mm exposures on 35 mm film. Uses f3.5/35 mm lenses. Item comes with brown leather case branded with Kodak on the front and lens cap. This item is black a 35mm stereo camera with f3.5 lenses and seperate detachable flash. Item consists of a one-time use camera loaded with a 27 exposure roll of Kodak Max 35mm film for colour prints. Develop before date is January 2005. 15 unexposed pictures remaining. Item consists of a one-time use camera loaded with a 27 exposure roll of Kodak Max 800 ISO 35mm film for colour prints. Develop before date is May 2003. Item consists of a one-time use camera loaded with a 27 exposure roll of Kodak Max 35mm film for colour prints. Develop before date is January 2003. Item consists of a one-time use camera loaded with a 27 exposure roll of Kodak Max 35mm film for colour prints. Develop before date is August 2002. Item consists of a one-time use camera loaded with a 27 exposure roll of Kodak Max 800 ISO 35mm film for colour prints. Develop before date is April 2001. Item consists of a one-time use flash camera for indoor/outdoor use loaded with a 27 exposure roll of Kodak Max 800 ISO 35mm film for colour prints. Develop before date is May 2002. 13 unexposed pictures remaining. Item consists of a disposable camera for outdoor use only loaded with a 27 exposure roll of Kodak Gold 35mm film for colour prints. Develop before date is February 1998. Item consists of a disposable camera for outdoor and underwater use loaded with a 24 exposure roll of Kodacolor Gold 400 ISO 35mm film for colour prints. Develop before date is January 1992. Item consists of a one-time use water & sport camera for outdoor use loaded with a 27 exposure roll of Kodak Max 800 ISO 35mm film for colour prints. Develop before date is March 2004. 21 unexposed pictures remaining. Item consists of a one-time use camera loaded with a 27 exposure roll of Kodak Max 35mm film for colour prints. Develop before date is October 2003. 7 pictures remaining unexposed. Item consists of a disposable camera for outdoor use loaded with a 12 exposure roll of Kodak Gold 400 ISO 35mm film for colour prints. Develop before date is February 1998. Item consists of a disposable camera for outdoor use loaded with a 12 exposure roll of Kodak Gold 400 ISO 35mm film for colour prints. Develop before date is January 1997. Item consists of a disposable camera for indoor/outdoor use with flash loaded with a 15 exposure roll of Kodak Gold 800 ISO 35mm film for colour prints. Develop before date is April 1998. Item consists of a one-time use waterproof camera for outdoor use loaded with a 27 exposure roll of Kodak Max 800 ISO 35mm film for colour prints. Develop before date is April 2002. 19 unexposed pictures remaining. Item consists of a disposable camera with flash loaded with a 27 exposure roll of Kodak Gold 800 ISO 35mm film for colour prints. Develop before date is April 2000. Kodak FunSaver 35 Clear, Brighter Prints! Item consists of a disposable camera for outdoor use only loaded with a 27 exposure roll of Kodak 35mm film for colour prints. Develop before date is October 2002. Item consists of a disposable camera for use in bright light loaded with a 27 exposure roll of Kodak 800 ISO 35mm film for colour prints. Develop before date is February 2004. Item consists of a disposable camera loaded with a 27 exposure roll of Kodak 800 ISO 35mm film for colour prints. Develop before date is May 2002. Item is a disposable camera loaded with a 27 exposure roll of Kodak Gold 400 ISO 35mm film for colour prints. Develop before date is February 1997. Item is a disposable camera loaded with a 27 exposure roll of Kodak Gold 400 ISO 35mm film for colour prints. Develop before date is April 1995. Item consists of a one-time use camera loaded with a 27 exposure roll of Kodak Max 35mm film for colour prints. Develop before date is October 2003. Item consists of a one-time use camera loaded with a 27 exposure roll of Kodak Max 800 ISO 35mm film for colour prints. Develop before date is May 2002. Item consists of a one-time use camera loaded with a 27 exposure roll of Kodak Max 800 ISO 35mm film for colour prints. Develop before date is April 2001. 21 pictures remaining unexposed. Item consists of a one-time use camera loaded with a 27 exposure roll of Kodak Max 800 ISO 35mm film for colour prints. Develop before date is February 2002. Item consists of a one-time use camera loaded with a 27 exposure roll of Kodak Max 35mm film for colour prints. Develop before date is December 2003. Item consists of a disposable camera for outdoor/indoor use loaded with a 12 exposure roll of Kodak Gold 400 ISO 35mm film for colour prints. Develop before date is April 4 1996. Item consists of a disposable camera loaded with a 27 exposure roll of Kodak 800 ISO 35mm film for colour prints. Develop before date is March 2002.